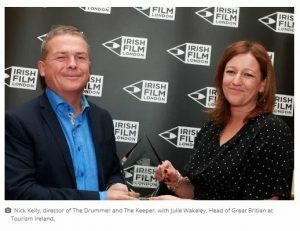 We are delighted to announce that Nick Kelly’s debut feature film ‘The Drummer & The Keeper‘ has just won “Best Feature Film” at the Irish Film Festival Awards in London tonight. We are also very honored & proud that Jacob McCarthy who plays ‘Christopher’ won the Ron Hubbard award for “Best Actor”. The awards event is the official launch of the Irish Film Festival in London which opens on 29th November with a screening of The Drummer And The Keeper. Tickets are available here for The Drummer And The Keeper screening at 6.45pm at Picturehouse Central on November 29th. The screening will be followed by a Q&A with Nick Kelly. Photo courtesy of http://www.theirishworld.com who covered the event. You can read their report & view more photos from the night here. Here is our trailer so you can check it out.